Found 15 file extension associations related to gBurner and 4 file formats developed specifically for use with gBurner. 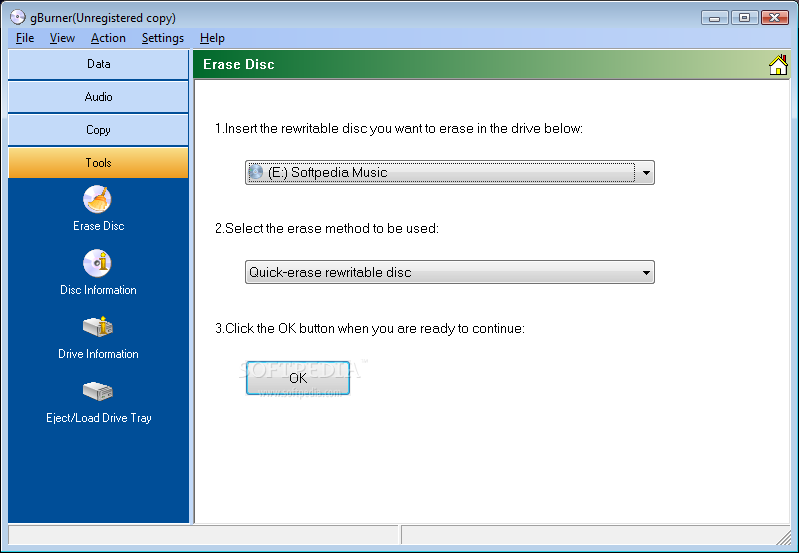 gBurner is a powerful and easy-to-use CD/DVD burning tool, which allows you to create and burn data/audio/video CDs and DVDs, make bootable data CDs and DVDs, create multisession discs. gBurner is also a disc image file processing tool, which allows you to open, create, extract, edit, convert and burn ISO/BIN image files. Create and burn data / audio / video CD and DVD. gBurner supports the following disc types: CD-R, CD-RW, DVD-R, DVD-RW, DVD-R DL, DVD+R, DVD+RW, DVD+R DL, DVD-RAM. Burn data, audio and video image file. Support Mp3, Wma, Wav, Flac and Ape Audio formats. Open, create, extract, edit and convert ISO/BIN Image file. gBurner can convert almost all image file formats to ISO/BIN image file format. Support gbi, daa, and uif compressed disc image file. If you need more information please contact the developers of gBurner (gBurner Systems, Inc.), or check out their product website.